Spices can everyday foods turn into a true culinary magic, but, besides being used in cooking to enrich foods, spices can help in weight loss. 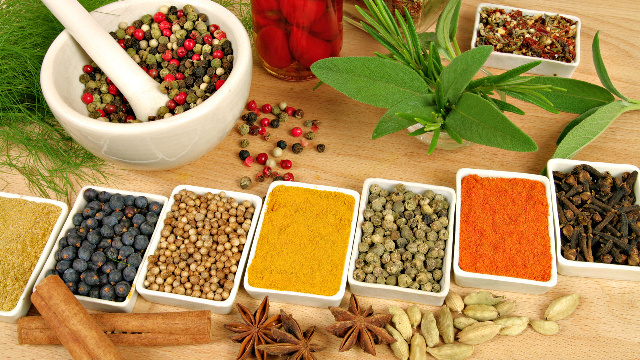 We know already that some spices are rich in antioxidants, have a strong anti-inflammatory properties, and some work antibacterial and antifungal. When preparing meals use less salt and more spices. They retain water in the body and prevents the removal of waste products. Chili’s – Recent studies show that chillies increases metabolism, burns calories, regulates insulin levels and lowers blood sugar. Adding a little chilly in the food each day, except that you will do good for your health, it will help you in maintain a slim figure. Black pepper – Has the ability to improve digestion and increase the absorption of nutrients. Its main ingredient, an alkaloid piperine, for several hours after intake increases fat burning for eight percent. The best is freshly ground, because then contains most of piperine. Black pepper stimulates the metabolism, kidney function, an enzyme related to welding. You can put it in almost all foods, added to salads, sandwiches etc. Mustard – Scientists from the Institute of Oxford found that only one teaspoon hot mustard boost metabolism by 15-20 percent. Mustard stimulates and speeds up the metabolism and burn fat, stimulates circulation, and thus the work of bile, which has a role to burn fat. Lemon peel – According to a US study substance from lemon peel prevents the conversion of excess carbohydrates into fat. Cinnamon – Research shows that just one teaspoon of cinnamon a day promotes weight loss, because this spice lowers blood sugar, promotes healthier processing of carbohydrates, reduces the total level of cholesterol. However, before eating cinnamon spice, refer to the fact that this spice is a chemical coumarin, which can damage the liver if taken in large quantities. Freshly ground cinnamon add to your morning coffee or tea, in muesli, yogurt or ice cream. Oregano – The leaves contain essential oil thymol, bitter substances and tannin (encourage the work of the gallbladder and liver). It stimulate kidney function and contribute to expel fluid from the body. If you can, use them fresh (add leaves in a meal at the end of cooking). Turmeric – Has more than 150 medicinal properties. Turmeric is a powerful antioxidant that has anti-inflammatory properties, and most importantly, anti-cancer properties. Turmeric reduces the accumulation of adipose tissue, thereby it prevent weight gain. Ginger – Increases the output of urine, improves mobility of the digestive tract, preventing absorption of cholesterol, accelerates the removal of toxins. In short, the doctors believe that it stimulates metabolism. In the fresh form it strengthens the digestive tract, lungs, stomach and spleen and eliminates the headaches caused by circulatory disorders. Ginger has anti-inflammatory, antiseptic, antibacterial and antiviral properties that can do positive things for health. For the ginger is known to be thermogenic foods that raises body temperature and as we said, helps speed up the metabolism. In this way, the body burns more fat than usual. Mainly the root is used, because it contains essential oils and bitter substances that calm the nervous system, stimulate the secretion of saliva, gastric juices and bile. Additionally, the root contains enzymes that break down proteins, thus preventing buildup of harmful substances in the intestine. Grate the root and add it to sauces, salads, rice dishes, as a condiment with chicken or make juice by clean the root of the size of five centimeters, chop it into slices, put in a liter of boiling water and drink after 20 minutes, warm. The amount is enough for one day.